30+ Wedding poses and pre-wedding photography poses to check out before facing the camera on your big day! But worry not, I have made a huge list of wedding poses and pre wedding photography poses for you to have a look and get a clue on how to pose with your better half. Safe to say, you won’t be standing in front of the photographer totally clueless! 1. Be yourself: Even your photographer will tell you that. You are clicking pictures with your partner. Be with them as you would be even with no camera in front of you. This will give you the best candid couple shots! 2. For a pre-wedding photo shoot, it is always advisable to wear outfits that are comfortable and easy. You don’t want to wear a 10-kg lehenga and look awkwardly smiling in your photoshoot poses! 3. Refer to the wedding couple poses, pre wedding photoshoot poses to get major hints on how to face the camera like pro (pictures below)! 4. Choose a familiar location for a pre wedding photo shoot. If it is a place of your first date or a place where the proposal happened, even better. When you revisit, it will be a trip down the memory lane, giving you much more ‘in-love’ and natural pictures. 5. For wedding couple photography poses, pick a place in your venue which is a bit secluded. This will ensure no disturbing from relatives and kiddos. The picking up in arms pre wedding photo pose. Classic! Another pre wedding photo pose with the bride on your lap! Bonus points for a spectacular backdrop! Tip: You can use this for your wedding couple poses photography as well! The proposal one perfect for your pre wedding photography pose! If captured at dusk, you can even make it into a silhouette! Pre wedding photography poses that include your pets are literally the cutest! Include your doggo in your romantic pictures and be sure to get a lot of awws! If you are not the ones to shy away from PDA, please please give this pre wedding photography pose a shot! There is literally no place better than your own home for a pre wedding photoshoot. Get cosy and comfy at your home and click pictures with intimate couple poses, which you can hang in your bedroom later! Also, if you are up to doing a boudoir photo shoot, check out these pictures for inspiration! This is the most natural couple photography pose ever! Bride’s head on the groom’s shoulder, both of them looking completely at peace with each other’s company! Kisses never go out of style, do they? Such kind of Indian wedding poses are perfect to click just before all your ceremonies and all the madness starts. Believe me, it will calm you down before being in front of so many guests and taking your vows! Another super-romantic Indian wedding couple pose clicked just before the reception party! Or a smooch just after exchanging varmalas! Wedding photo poses that capture the couple’s embrace are the best! The traditional wedding photography pose that makes for the perfect couple portrait! Wedding photo poses that bring out the fun and quirky side of the couple! The bridal lehenga twirl and groom watching or helping her twirl is a classic wedding photography pose you can definitely give a shot! 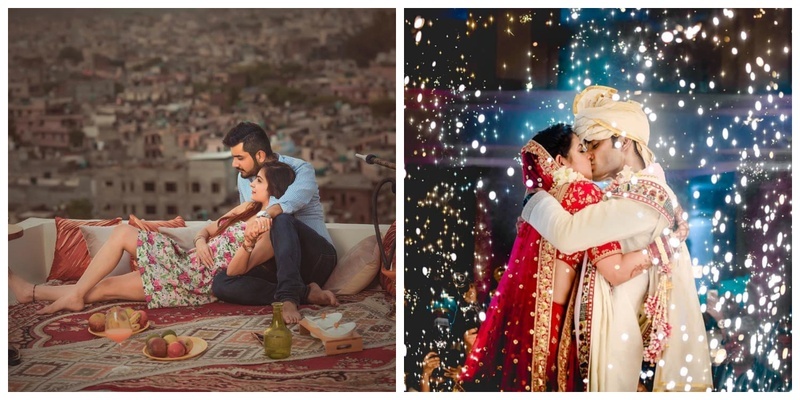 Hope all these wedding photography poses gave you a hint on how to stay calm and pose in front of the camera on your big day and pre-wedding shoot!